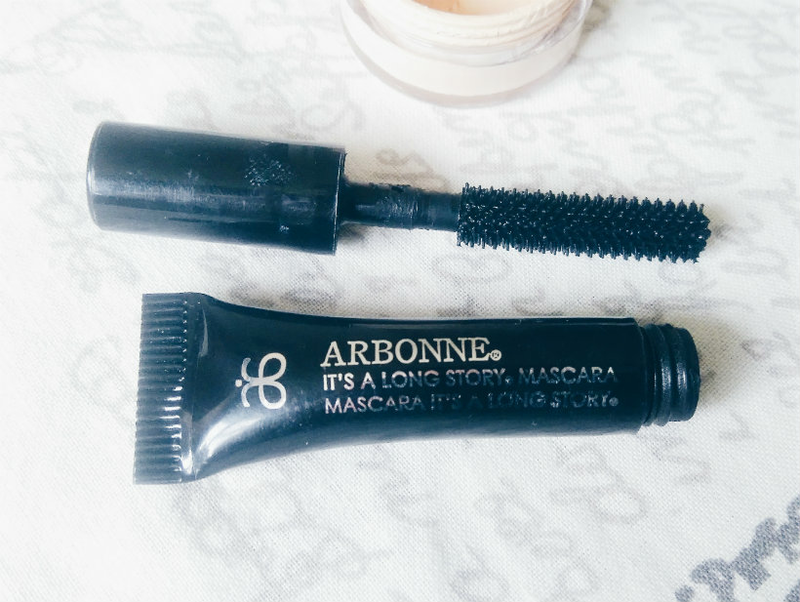 I barely knew anything about Arbonne before I tried these products. I love that, though. I love trying out new brands, seeing what works for me (and what doesn’t). I love knowing there’s another cruelty-free option out there for everyone to use. Arbonne’s philosophy can be summed up in three words: pure, safe, and beneficial. All their products are cruelty-free, gluten-free, and vegan. 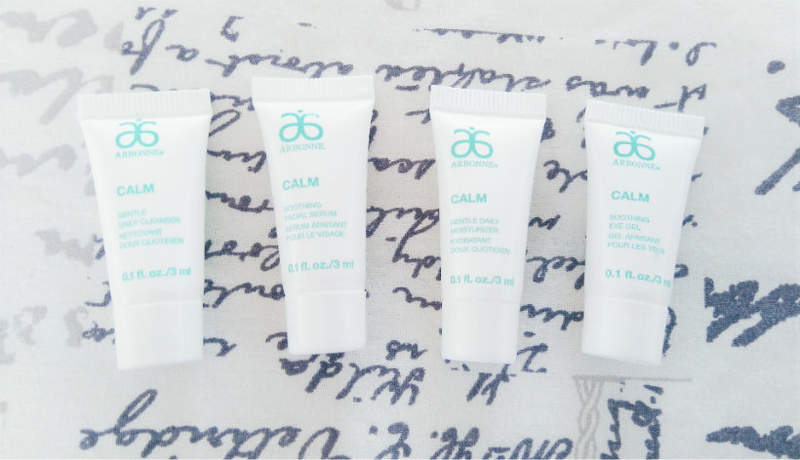 Calm is designed for sensitive skin, so I was hopeful that it wouldn’t upset my acne. I used the range every day for a week and thankfully there were no major flare-ups. Key ingredients include aloe vera and cucumber to soothe, and liquorice and chamomile to calm irritated skin down. The Calm routine has four steps. I started by using the Gentle Daily Cleanser* (v) (£18 for 148ml). I like something a little creamier for make-up removal but this light, sulfate-free gel is ideal for mornings and second cleanses. It left my skin feeling clean but didn’t dry it out. I followed this with the Soothing Facial Serum* (v) (£37 for 30ml), a lightweight gel that promises to lock in moisture. My skin felt smoothed but not in the same velvety way you get from a silicone-based product; it felt more breathable. However, I didn’t find it particularly hydrating. Now, the Soothing Eye Gel* (v) (£24 for 15ml) did feel hydrating and my eye make-up sat well over the top. The gel sinks in quickly without leaving a sticky residue. The last step, Gentle Daily Moisturiser* (v) (£27 for 118ml), was comforting but didn’t feel too heavy. It was enough to moisturise the dry parts of my face without upsetting the oily T-zone, at least initially, but skin did feel more tight as the day went on. Over the week I used this set my acne began to dry up and calm down, even though everything else in my routine stayed the same (including my horribly polluted route from the station to work). A week is not a long time for skincare to make its mark, so it could have been that my acne was just at the drying out stage anyway. But the Calm set certainly helped. The cleanser is definitely my favourite, since it can be difficult to find a gel without sulfates. Created a smooth base and my foundation glided on. However, it didn’t stop my foundation from clinging to a couple of dry patches on my chin, something I was a bit taken aback by considering the primer is £29. On the plus side, it didn’t make my skin feel super-oily like some primers do, so swings and roundabouts! This foundation has a thick, creamy texture but it didn’t look or feel cakey on my skin. Arbonne say it has medium to full coverage but I’d say it was more full — it’s very good at hiding redness. It doesn’t oxidise at all, but it does cling to dry patches. The shade I tried, Porcelain, is pale with yellow undertones, which I like in a foundation. The shades are split into three groups — cool, neutral, and warm — and there’s something for a wide range of skintones, including women of colour. A lengthening mascara with a long brush. It created a natural flutter, the kind that gives you spindly lashes, but it also acts as a good base if you want to layer a volumising mascara over the top for extra impact. A mixed bag, I think you’ll agree, but I had so much fun trying everything out and I’ll be considering the full-size Gentle Daily Cleanser next time I need something new for my second cleanse. A big thank you to Tracy from Arbonne for sending these samples over! 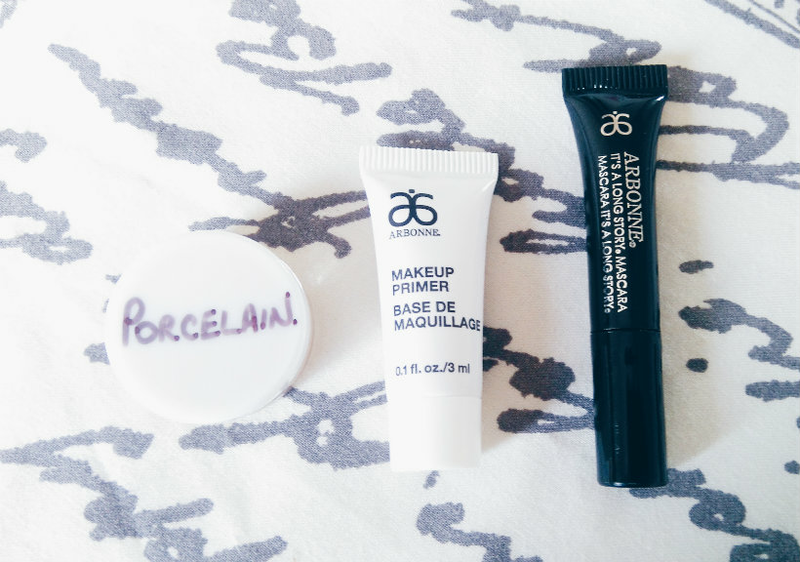 Have you ever tried anything from Arbonne before? What are your favourite vegan brands? Let me know in the comments!